I love making smoothies. I do these year round. Really can’t say I have a recipe as such, as it’s pretty much toss whatever looks good into the blender (my beloved Vitamix, of course! ), and mix it all up. We buy big bags of frozen fruit and berries regularly, so there’s no ice in any of my smoothie recipes. I do have some ingredients I use regularly, and that’s what I’ll list here. I don’t use all of these at once; it’s more of a mix and match thing. Place selected ingredients in your blender. Add enough fruit juice or other liquid to help it blend and keep it from getting too thick to drink. Taste before serving to make sure you have a good flavor, and have fun experimenting. 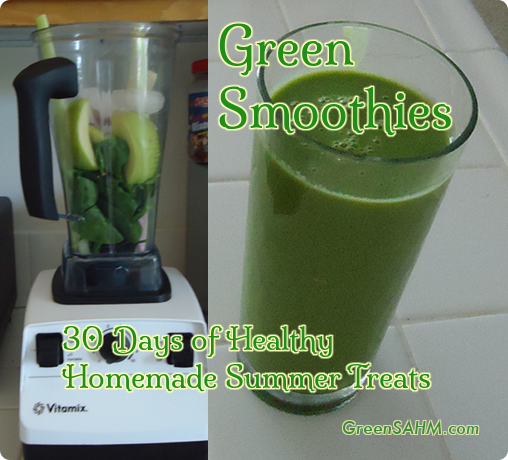 Most of my smoothies are at least a little green. Spinach is so easy to add, and doesn’t change the flavor all that much. Kale works well too. But if you want something that will definitely work as a green smoothie, with a nice green shade, there are some things you should do. Skip the berries, for example. I love berries in my smoothies, but you’ll get a more muddy color if you mix the red of the berries with the green of the spinach. It’s not that appealing to kids, while green can be a fun color. Don’t add chocolate or cacao nibs either, as once again, it will have more of a brown color. Stick with ingredients that will allow the green to show. Now if your kids don’t mind a brownish tint, go for the berries and/or chocolate. We’re going for delicious, after all, along with healthy. Place all ingredients in blender. Puree until smooth. Add milk, juice or water if smoothie is too thick. Serve. Homemade Baby Food and Smoothies? I’ve been keeping really busy making homemade baby food. I was thinking of it as something just for the baby, but it’s turning out to be good for the rest of the family too. My son likes to snack on the frozen cubes of fruit. Can’t complain about that. But I was pretty surprised when my husband started throwing cubes of baby food into smoothies. But it made sense really quickly. They’re kind of the same thing. Homemade baby food is a really easy way to add some vegetables into a smoothie. Green beans hardly change the taste of the smoothie at all. We’ve always tended to throw a carrot into smoothies. We’re thinking squash should work well too. 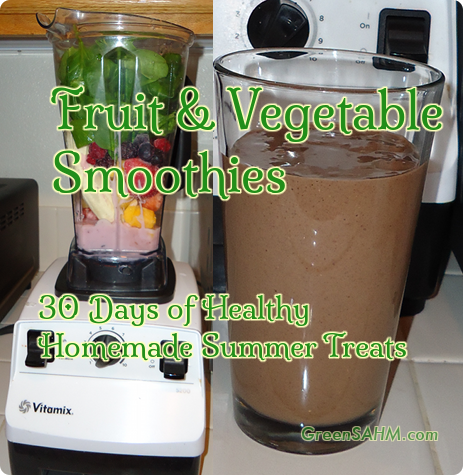 It just nice being able to throw the fruit and some veggies into the blender and come up with something healthy to drink or make into popsicles. Using the baby food means that vegetables are just that much easier to add, since they don’t need more preparation.